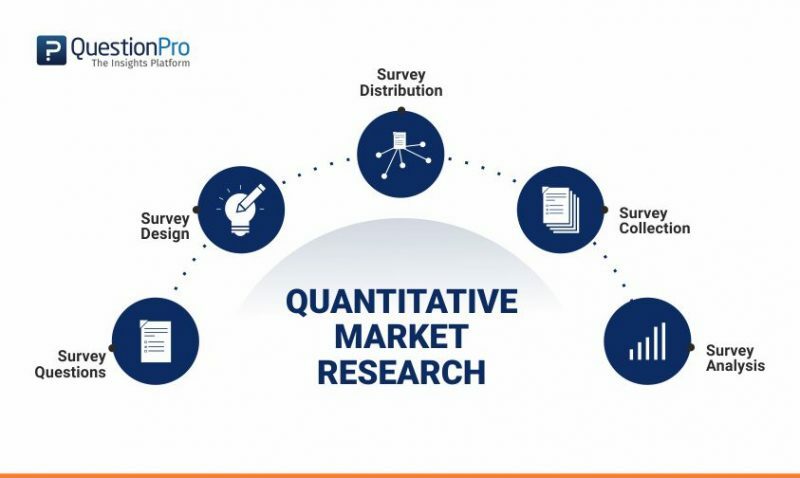 Quantitative Market Research is a technique to ask questions to the target audience in an organized manner using surveys, polls or questionnaires. Received responses can be analyzed to make well-thought decisions for improving products and services, that will in turn help increase respondent satisfaction levels. Well-founded results can be achieved in case a large sample size that represents a population is surveyed. The age of Information has transformed both selling as well as purchasing habits and norms. “Information” or “data” is now more valuable than gold. Companies rise and fall on the basis of how well they are able to collect and analyze data and make informed decisions based on the gathered insights. Any evolved customer who makes a purchase online can tell how quickly businesses have become “customer-centric”. And the first step towards becoming a customer-centric business is through customer feedback and research. For instance, “Based on your overall experience with us, how likely are you to recommend us to a friend or colleague?” – This one question, the Net Promoter Score question, changed the game for businesses across the Globe. With just 1 question, companies are now able to collect real data from real customers on how well their organic word-of-mouth referrals can grow their business and how less/more they have to spend on paid advertising and promotions or which area of their product or service quality requires improvements. This is just 1 in hundreds of such Quantitative Market Research survey questions that have fundamentally and exponentially helped organizations, including nonprofits, charities, educational institutions and business alike, to make decisions that are based on real data! Organizations are dependent on quantitative analysis for the statistical evaluation of data because it gives systematic, detailed information about the problem at hand or the target audience. 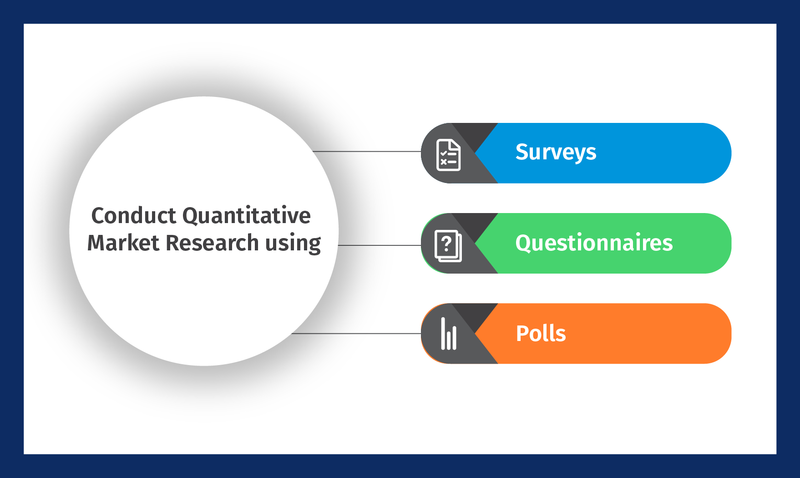 This market research technique revolves around surveys, questionnaires and polls and the data collected is evaluated numerically, statistically, mathematically to form better strategies and marketing plans. 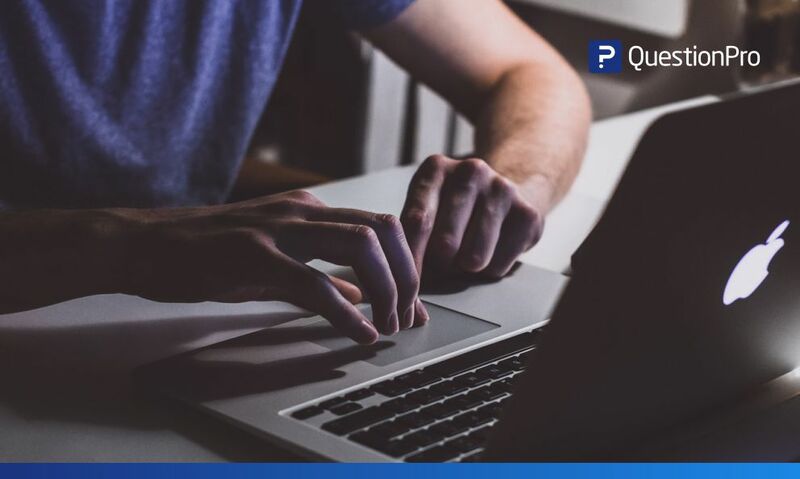 But before we dive into the steps that are required to carry out a successful Quantitative Market Research study, let’s look at a few more critical reasons why you need to do so. Research is the first step for a successful marketing campaign, be it a new product launch, sales pitch positioning or conducting a data-oriented statistical analysis. By conducting an online quantitative market research, insights about marketing activities like updating the website, social media page management or newsletters can also be received. By implementing Quantitative Market Research, questions like “Who are currently buying my products/services?”, “Why are the others not buying my product?”, “How to reach out to my potential clientele?” are answered. Quantitative research starts with survey creation, designing, and distribution. After the survey is sent out to the right people, data collection and analysis has to be done to get desired insights. As the name implies, Quantitative market research focuses on the quantity and structured collection of data. 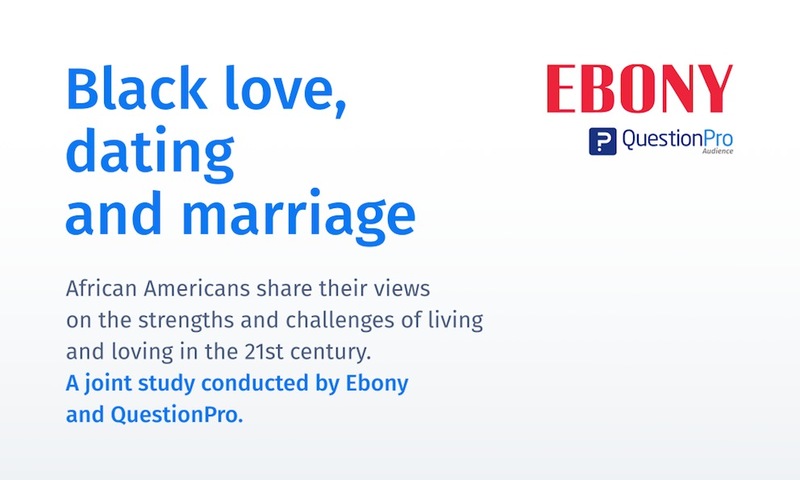 It began with face-to-face techniques and now has evolved into online surveys like those provided by QuestionPro. It is often used to capture data like customer behavior, size of the market, identifying reasons for product repurchase. This type of market research is usually based on a large number of samples. The premise that quantitative market research operates on is to confirm the hypothesis of the phenomena of how many. The data collected is solely in the form of numbers and statistical formula can be applied to this data to come up quantified actionable insights. Data collected and the mode of collection is very structured. It is a mix of questionnaires, surveys etc. The research study is designed in a way that the questions are structured and the possible responses to these questions are also structured. This is laid out well in advance before the study. Since the questions are not open ended, they point towards certain answers so the scope for uncertainty is limited. 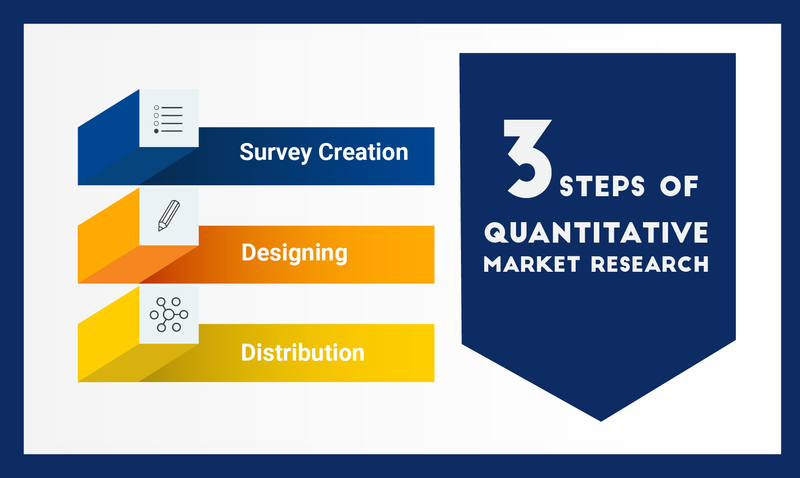 What is the methodology for creating a successful quantitative market research survey? Make an observation of something that is unknown to you. Investigate the theory that is related to your issue or the field that requires validation. Create an in-depth hypothesis to validate your research and findings and end objective. Plan for how to prove or disprove this hypothesis and create a structure to achieve this objective. Collect and analyze your data. If your data validates your hypothesis, prepare for final validations and to present findings. If the data disproves your hypothesis, you can either start afresh with a new hypothesis or drop your current research. The milestones mentioned above fall under 5 quantitative design types namely; survey research, descriptive research, correlational research, causal-comparative/quasi-experimental research and experimental research. What are the common techniques to conduct a quantitative market research? Cross-sectional research survey: Cross-sectional market research is a quantitative market research method that analyzes data of variables collected at one given point of time across a sample population. population or a pre-defined subset. This research method has people who are similar in all demographics but the one that is under research. 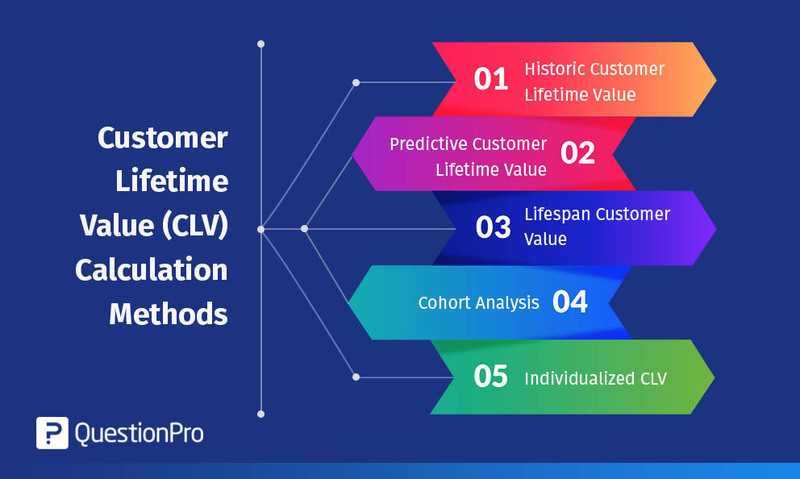 Longitudinal research survey: Longitudinal market research is a quantitative market research method where research is conducted over years or decades on a target demographic markets or certain individuals to collect statistical data. Face-to-Face Interviews: An interviewer can prepare a list of important questions in addition to the already asked survey questions. This way, interviewees provide exhaustive details about the topic under discussion. An interviewer can manage to bond with the interviewee on a personal level which will help him/her to collect more details about the topic due to which the responses also improve. Interviewers can also ask for an explanation from the interviewees about unclear answers. Secondary techniques to conduct quantitative market research are a means to validating a hypothesis or drawing conclusions from empirical data and primary data. This research method is a form of observational market research where historical data helps validate the statistical observations of the primary data. For example: mapping the purchase of snowblowers to the months where sales spike with historical data of inclement weather helps manage supply and demand as well as trained personnel during those months. 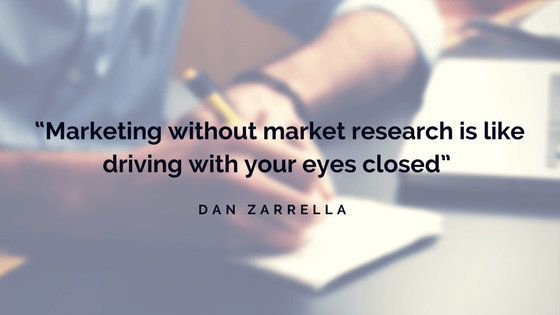 Specify the Goal: Why do you want to conduct this market research? There should be a clear answer to this question so that the steps that follow are smoothly executed. Have a Plan Sketched Out: Every step that needs to be achieved has to be put to paper like the tools that are required to carry out the research, survey templates, the target audience etc. This may vary from project to project. Collect Data: This is the most crucial step in this market research. Data is collected through 3 main mediums: online surveys, telephone interviews or email surveys. Analysis of Collected Data: Once the data is gathered, it needs to be analyzed. Various methods of analysis like SWOT Analysis, Conjoint Analysis, TURF Analysis can be carried out to get best results. Compile Reports: A report consisting of graphs, charts, and tables should be created so that the person in-charge of the report can incorporate the observed changes. Guesswork or limited awareness of numbers can never result in the success of an organization. 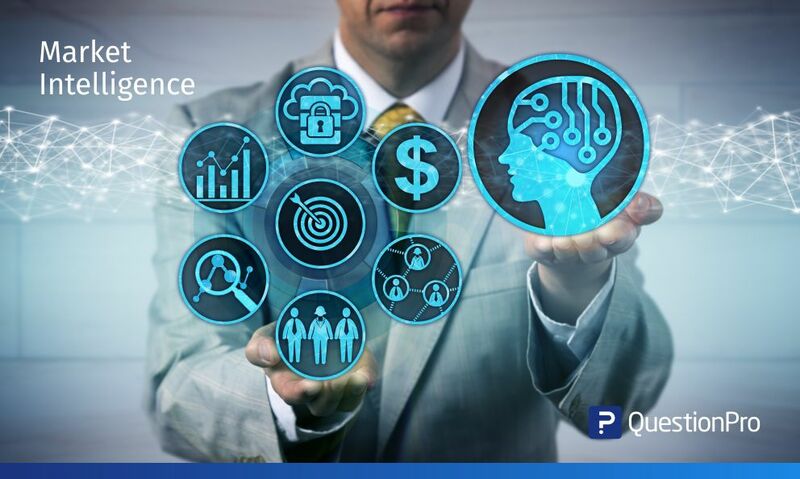 Quantitative market research offers the perfect medium for researchers to analyze customer behavior and adaptability so that the growth of the organization isn’t hampered. Quantitative market research questions produce answers for “Who” and “What”. Qualitative market research questions produce answers for “Why”. Quantitative questions are usually close-ended and are simpler to analyze when compared to the qualitative counterparts which are open-ended and much harder to analyze. If you’re looking to obtain statistics and quantifiable results, you can implement quantitative market research questions. These questions are easy for the respondents to answer. Due to their close-ended nature, a sizeable quantity of questions can be asked without having to worry about whether the respondents will get irritated by them or not. Quantitative questions can start with “how” or “what” and can be used in questions such as “how frequently” or “how many” or “what are” or “what is the extent”. Net promoter score: This question can be asked to evaluate customer satisfaction and brand shareability. It’s usually a 0-10 scale which provides a very filtered yet efficient perspective about brand recommendation. The respondents are divided on the basis of the provided input. Likert-scale: It’s a psychometric question to evaluate customer opinions towards a particular situation with two polarities at each end of the scale. The Likert-scale question has a statement and 5, 7 or 9 response options for the respondents to choose from. These questions used for customer satisfaction, employee satisfaction, and academic surveys. Semantic-scale: Semantic differential rating scale is used to ask quantitative questions about ideologies, products or events with grammatical opposite options at the polar positions of the scale to measure their implicative meaning. Multiple-choice: These fundamental components of a survey can be vital in getting the best responses in quantitative research as they provide the exact options that an organization would want their respondents to choose from. Matrix questions: These are multiple choice questions assembled in form of a matrix. They are extremely convenient for survey makers to create and analyze these kinds of questions and for respondents to construe and answer. Quantitative market research uses a host of statistical analysis techniques to process the response data and derive meaningful and clear insights. These insights gathered from statistical analysis enables researchers to derive the final conclusion of the quantitative research. Conjoint analysis is a method used to identify the value of various attributes such as cost, features, benefits for the customers that lead to the purchase of a particular product or service. With increasing technology implementation features in devices and gadgets, this analysis method has been widely adopted for product pricing, market placement, and product launch. TURF (Total Unduplicated Reach and Frequency) analysis allows an organization to gain insights on a combination of products/services that’ll attract the highest number of customers. This is done by producing the reach and frequency of unduplicated data from the obtained responses. GAP analysis is used to calculate the difference between the desired and actual performance of a particular product/service. By measuring this, an organization can make improvements to mend the gap and make their attributes more appealing to reduce the gap. Also known as “best-worst” scaling, MaxDiff is choice-model used to acquire customer preferences of multiple characteristics such as product features, brand images, and preferences, activities around the branding etc. It does have some similarity to Conjoint analysis but is much simpler to implement and analyze. Cross-tabulation is a statistical analysis tool that allows comparison of two or more categories in a brief tabular format for convenient data analysis. Produces numerically rational theories: The result of the quantitative research is based on numbers because of which results are extremely instrumental for an organization to make well-thought decisions to market a product/service in a better manner. The numbers analyzed in this can be then put into charts and graphs for better representation and review. 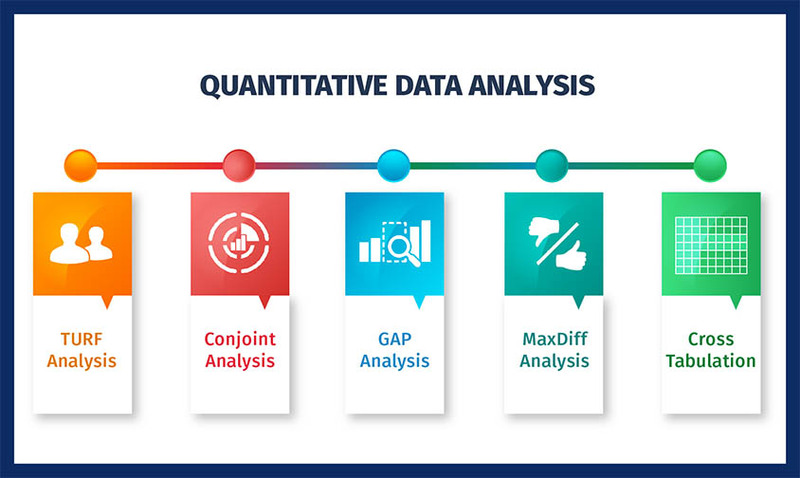 Easily calculable and analyzable data: Due to the exactness in the answers received for quantitative questions, it’s extremely favorable for research to evaluate the data. Enhanced willingness of respondents: Quantitative research mostly comprises of close-ended questions which are quick and less time-consuming for the respondents to answer. This is an essential reason for high response rates for this market research. Less investment to create brand awareness: These days, quantitative research is used for brand awareness which is generally conducted through online mediums. Cost invested in the research is thus reduced to create awareness about the brand. Statistical data isn’t always complete: Data could be collected from a huge number of people but there is no way to dig deep down into they “why” of an answer. Data isn’t actionable with just numbers and no concrete explanations to back that data. Structured interviews and questionnaires: The biggest strength but also a weakness of quantitative market research questions is the limited scope to digress from a structured answer. Whilst this provides actionable numbers, the questions do not allow to validate those numbers due to the nature of how the survey is set-up. Sample size isn’t indicative of a larger population: If the respondents of the market research survey have attributes that do not match those of a larger demographic, the data collected cannot be equated to a larger sample as the data collected isn’t necessarily a representation of the larger audience. Self-report isn’t always trustworthy data: People when given the liberty to respond to a survey are skeptical to give out too much information and if any information provided is incorrect or haphazard, that discounts the complete validity of the survey. 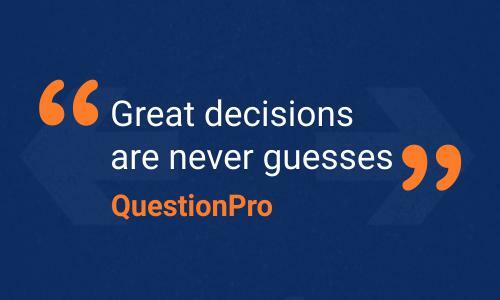 How does Quantitative Market Research work using QuestionPro? 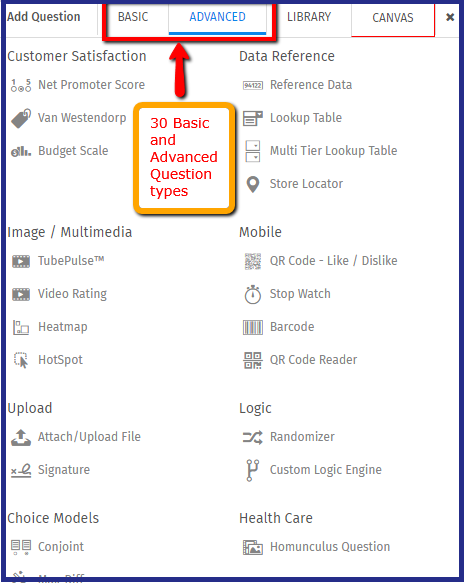 QuestionPro offers a string of standard and advanced question types like single select, multi-select, net promoter scale or van westendorp etc. that can be chosen to create a powerful survey. 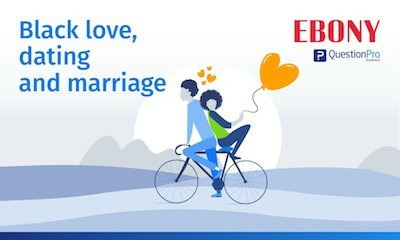 The survey has to be branded and personalized as per your company policies and also has to include logic and branching suitably. Distribution of surveys using the right mediums is an integral part of data collection. You can reach as many people as you wish to by using sources like Emails that can also be scheduled, QR code, Mobile application that allows offline data collection, Automated IVR surveys, and Web intercept surveys. Responses are updated on a dashboard as and when respondents take the survey. As a survey maker, you can keep an eye on the live updates of the customers who’ve started the survey but not yet finished it or who’ve completed it or who’ve just begun, on the dashboard. 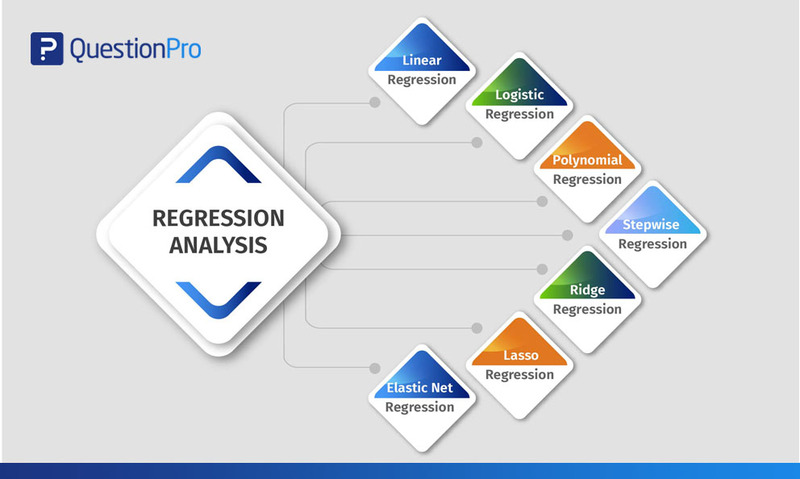 Using techniques like Conjoint Analysis, SWOT Analysis, TURF Analysis, one can obtain a solid statistical understanding of the collected data for organizations and academicians. The updates in analytics are done in real-time using advanced analytics programs. This marketing research method is used to know how alike do people think about a certain product and derive results for data-oriented decision making. When a new product is being launched or a product is being upgraded, quantitative market research can be put to use to know what the target audience thinks about the change and whether it will be well adapted.